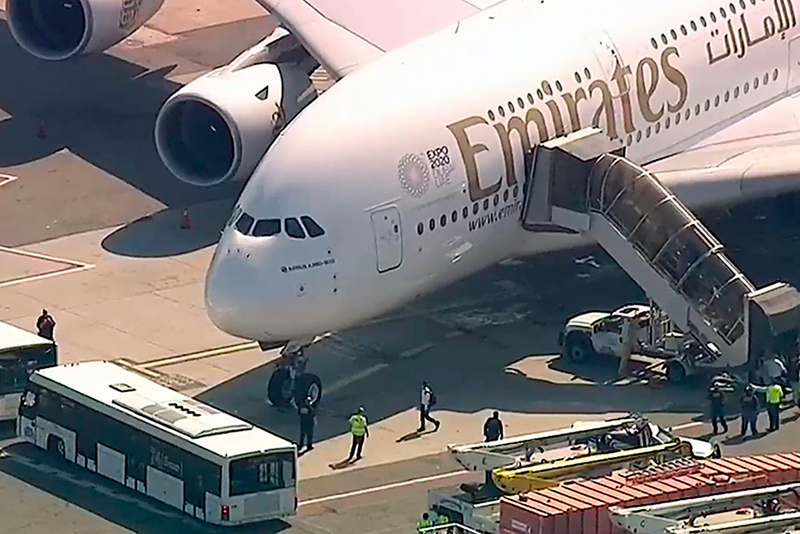 Dubai: An Emirates Airline flight from Dubai was quarantined at New York’s John F. Kennedy International Airport on Wednesday after some passengers became ill during the flight. "The Emirates cabin crew were super-helpful, they were not in panic mode, which was amazing," Makki, 36, said in an interview outside of John F. Kennedy Airport. "Then we got the American officials check every one of us until we got out. They dealt with it really well." Makki, a television host from Dubai, said. Emirates has confirmed that all passengers on its flight EK 203 have left the aircraft after they were subjected to medical examination by the competent authorities at JFK, and three passengers and seven crew members were taken to the hospital for additional examinations and treatment. Nine other passengers underwent additional tests at the aircraft's site before being allowed to leave, and the rest of the passengers were then sent out of the airport through immigration and customs. The crew and our ground staff have shown every cooperation with the authorities during the passenger inspection of the aircraft, which has mow been now delivered by aviation officers. Due to the delay with the inbound flight, the return flight EK204 from JFK to Dubai will be delayed by approximately 3 hours, tweeted Dubai Media Office. Passengers with connecting flights in Dubai who are impacted by the delay will be assisted with rebookings by Emirates local ground staff. Emirates crew and onground staff extended our full cooperation with the authorities during the onboard screenings, said Dubai Media Office. Emirates tweeted echoed the update. Emirates can confirm that about 10 passengers on board flight EK203 from Dubai to New York were taken ill. On arrival at JFK, as a precaution, they were immediately checked by local health authorities, and those needing medical attention will be attended to,” an Emirates spokesperson said. In a series of tweets, Emirates explained the goings-on at the airport. Dubai Media Office has also confirmed the statements issued by Emirates. Earlier, US media outlets reported that about 100 passengers became ill, but Emirates said the reports were inaccurate and put that number at 10. “All other passengers will be disembarking shortly. The safety and care of our customers is always our first priority and will not be compromised,” the spokesperson said. It is unclear why the passengers became ill or the state of passengers, but photos circulated on Twitter showed over a dozen police and emergency vehicles waiting metres away from the aircraft. US media outlets reported that the flight declared a medical emergency, and that the Centers for Disease Control and Prevention was present at the scene. Eric Phillips, press secretary for New York City mayor Bill de Blasio, said on Twitter that after disembarking from the aircraft, some passengers were cleared, while a few showed symptoms and were being held for treatment. He added that the flight was experiencing a flu outbreak, which could have been the cause of illness. The flight to New York, on a double-deck Airbus A380, was carrying around 500 passengers, and landed shortly after 9am (local time).